a) He Who takes incarnations again and again for the benefit of His devotees. b) He Who performs His function of creation again and again in cycles. c) He Whose true thoughts are always revolving around what He can do to help Hisdevotees. sam is an upasarga here, and can mean “well”, “from all sides”, etc.The term Avarta means “turning around, revolving”. The root from which theword Avarta is derived is vRt – vartane – to exist, to happen, to live on,to occupy etc. The amara koSa vyAkhyAnam is: Avartate carkravad bhrAmyati itiAvartah – That which rotates around like a wheel. a) SrI bhaTTar’s interpretation is that bhagavAn has this nAma because Hetakes incarnations again and again repeatedly as needed, for the benefit of Hisdevotees, even though He is birthless. 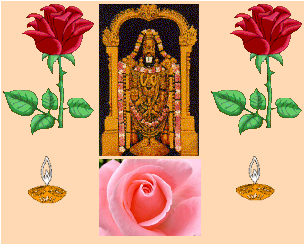 nammAzhvAr refers to Him as piRappu ilpal piRavi perumAn in tiruvAimozhi 2.9.5 (SrI v.v. rAmAnujan). b) SrI Sa’nkara gives the interpretation that bhagavAn has the nAma samAvartah because He skillfully turns the wheel of worldly life – samsAracakrasya samyag-Avartaka iti samAvartah. SrI kRshNa datta bhAradvAj gives thesame interpretation - samyag Avartayati samsAra cakram iti samAvartah. SrIbaladeva vidyA bhUshaN expresses the same idea – because bhagavAn repeatedlycontinues His creation in cycles, He is called samAvartah – samyak tAnAvartayati punah punah sRjati iti samAvartah. c) An alternate interpretation by SrI kRshNa datta bhAradvAj is thatbhagavAn is called samAvartah because His true thoughts are constantly revolvingaround what He can do to protect His devotees – samIcInah AvartanaS-cintanamsvajana avanamayam yasya iti samAvartah. a) He whose Nature is different from, and superior to, everything else (TrascendentalForm). c) He who is the AtmA of those who practice the nivRtti dharma (Bestower ofbenefits according to karma). d) He whose nature is that He is free from the bonds of samsAra, even when Hetakes His incarnation amongst us (kRshNa incarnation). g) He Who has permeated everything completely. h) He Who is Himself un-impacted or withdrawn with respect to the effects of pralaya of sRshTi. i) He whose mind turns away from any feeling of self-glory over His kIrti orfame. SrI Sa’nkara has given the nAma-s as nivRttAtmA in Sloka-s 25 and 64, asvimuktAmA in Slokam 48, and as a-nivRttAtmA in Slokam 83, with nivRttAtmA beinghis alternate version in Slokam 83. What follows is a consolidation of the previous write-ups for this nAma. ThenAma has been explained in detail in the previous three instances, using theapproach that I have taken for all other nAma-s, namely, giving the differentanubhavam-s of the different vyAkhyAna kartA-s for the nAma in one place. Wewill take a look at the vyAkhyAna for this nAma from a different perspective inthe current write-up. 1. He has approached the elucidation for all the nAma-s with the emphasis onbhagavAn’s guNa-s of saulabhyam and sauSIlyam towards His devotees as theprimary guNa-s of bhagavAn that are of interest from the devotees’perspective. SrI Sa’nakra generally gives his interpretations with emphasis onthe parattvam or Supremacy of vishNu in his interpretations. This point has beenbrought out in detail in my write-up comparing the two vyAkhyAna-s, and has beenmentioned as a reminder under different nAma-s.
2. SrI BhaTTar is unique in viewing the 1000 nAma-s as a collection of 44discrete groups, each group consisting of a series of nAma-s describing aspecific incarnation or manifestation of bhagavAn. This aspect has also beenmentioned off and on during the discussion of the nAma-s.
Because of the general approach I have taken throughout, of summarizing thedifferent anubhavam-s of several interpreters under each nAma, I have inevitablylost the stress on the second aspect of SrI BhaTTar’s contribution in mywrite-ups, even though I try to mention this aspect off and on. In the currentview of the nAma nivRttAtmA, we will emphasize this second aspect of Sri BhaTTar’svyAkhyAnam for the four instances of this nAma. nAma 231 – as part of the group of nAmas from 226 to 247, reminiscent ofthe purusha sUkta-upanishad pratipAdita virAT svarUpam. nAma 453 – as part ofthe group of nAma-s from 451 to 463, describing the nara-nArAyaNa incarnation,as the nivRtti dharma pravartaka. nAma 604 – as part of the group of nAma-sfrom 590 to 606, describing His guNa as a conferrer of benefits to jiva-s basedon their karma. nAma 780 – as part of the nAmas from 697 to 786, describingHis kRshNa incarnation. The meaning for the word nivRtta is to turn away, to abstain from, to beabove worldly acts, etc. a) SrI BhaTTar’s interpretation for nAma 231(in the group of nAma-sdescribing the Transcendental Person described in purusha sUkatam etc.,), isthat bhagavAn’s svabhAva (Nature) is past the prAkRta svabhAva (the ordinarynature of mortals), and the meaning given is that His Nature as the Supremepurusha is superior to anything else, and stands above all other things. He isthe Master of the Transcendental Glory that is thrice the glory of the materialworld. He is the svAmI or Lord of all that is this Universe, and all that isbeyond this Universe. SrI Bhattar gives the following references: tripAdUrdhvaudait-purushah - The Purusha stands eminent in the parama-pada which has thricethe glory of the material world" - purusha sUkta 4. parAt-param yan-mahatomahAntam - He is greater than the greatest, more exalted than the most exalted.- taitti. nArAyanIya 1.5. SrI satya devo vAsishTha gives reference to the muNDakopanishad passage, oftwo birds sitting in the same tree, one representing the jIva and the other theSupreme Soul. His interpretation is: ni is an upasarga; the root involved is vRt– vartane – to exist, to happen, to live on, to occupy; or vRt – varaNe– to choose, to divide. The word nivRtta means One Whose Nature is different– svarUpa paryAyah (SrI vAsishTha). “BhagavAn creates the universe and protects everything, and is a Friend ofthe jIva-s and treats everything in His creation equally. He does not consumeany of the fruits of this world, but withdraws everything into Him at the timeof pralaya”. b) In SrI BhaTTar’ interpretation for nAma 453 in Slokam 48 (in the groupdealing with the nara-nArAyaNa incarnation), the anubhavam is that bhagavAn hasHis mind turned away from worldly desires. Since the nara-nArAyaNaincarnation deals with the life of austerity that He adopted, and He taught the nivRtti dharma to nara, this is an appropriate interpretation in this context. BhagavAn appeared as nara and nArAyaNa to teach the nivRtti dharma to theworld and to practice it with extreme detachment (BhagavAn’s form was nArAyaNain the role of the teacher, and nara in the role of the student). To indicateHis profound detachment (parama vairAgya) to material objects of pleasure, Hehad His mind withdrawn from them. The nara-nArAyaNa avatAra as well as thenivRtti dharma are embedded in this nAma. The avatAara emphasized nivRtti-dharmaand propagated the sacred ashtAkshara. The essence of nivRtti dharma is therealization that nothing is done for our benefit or by us, and everything is forthe benefit of nArAyaNa and happens because of Him. We are not for us or forsomeone else, but only for nArAyaNa. To indicate His profound non-attachment tomaterial objects, He has His mind withdrawn from them. About His meditation itis said - antarnivishTa bhAvam ca - He who has His thoughts concentrated onHimself. Also, Atma-dhyAna parAyaNAya - To Him who has His thoughts concentratedwithin Himself"; "hRd -admArpita mAnasam - Him with His mind fixed onthe lotus-heart", etc. c) For nAma 604, which is in the group of nAma-s dealing with His relationwith the jIva-s in giving them the results of their karma-s, SrI BhaTTar givesthe interpretation that He has this nAma because He is the AtmA of those whopractice the nivRtti dharma, or the life of renunciation. SrI v.v. rAmAnujan elaborates on how bhagavAn is the AtmA of those whopractice the nivRtti dharma. These are the jIva-s who do not have any interestin pravRtti dharma, and live their lives with the soul objective of doingkaimkaryam to Him. They are not interested in any fruit out of their actionexcept the bhAgyam of doing kaimkaryam to Him. BhagavAn gives them exactly that,namely He gives them His lokam from where there is no return to samsAra -viNNulagam taruvAnAi variaginrAn (tivuvAimozhi 10.6.3). In fact, even thoughbhagavAn is AtmA of these nivRtti dharma practitioners just as He is the AtmA ofall other creations, yet He considers that these nivRtti dharma followers as Hissoul that supports Him. Another name for these practitioners of nivRtti dharmAis j~nAnI, whom bhagavAn considers as His own soul. Of the two kinds of dharma - the pravRtti dharma and the nivRtti dharma,pravRti dharma takes us to the world of the pitR-s where we enjoy the fruits ofour karma, and come back to this world with the balance of karma-s to ourcredit; nivRtti dharma is that which leads one to moksha. d) For the current instance of this nAma in the context of the kRshNaincarnation, SrI BhaTTar’s anubhavam is that even though He took theincarnation among us for our benefit, and even though we are deeply immersed inpravRtti dharma, He keeps Himself in the nivRtti dharma, and is not in any wayaffected by worldly things, and so He continues to be a nivRttAtmA. Thus, even though the nAma is the same, the anubhavam is related to thecontext of the particular aspect of bhagavAn that is emphasized in that context.This vision of SrI BhaTTar in recognizing the connectivity between the differentnAma-s in sequence has also naturally taken care of the issue of avoiding punar-ukti. (The following list has been revised, and is slightly different from the oneposted yesterday. So it is included here). a) He whose Nature is different from, and superior to, everything else (TrasncendentalForm). h) He Whose Mind turns away fromsacrifices that are performed by those who are not qualified. i) He Who is Himself un-impacted or withdrawn with respect to the effects ofpralaya of sRshTi. j) He whose mind turns away from any feeling of self-glory over His kIrti orfame. (Interpretations a to d were posted yesterday. This is the continuation). For the rest of the write-up, new information that was not included in theprevious write-ups is included below. SrI Sa’nkara’s interpretation in Slokam 25 is that bhagavAn is callednivRttAtmA because He is free from the bonds of worldly life – The unboundSelf – samasAra-bandhAn nivRtta AtmA savrUpam asya iti nivRttAtmA. SrI BhaTTar’sinterpretation a) above is along the same as lines as this. For the incidence ofthe nAma in Slokam 48, SrI Samkara vyAkhyAnam is – svabhAvato vishayebhyonivRtta AtmA manah asya iti nivRttAtmA – He turns away from material pleasuresnaturally. SrI BhaTTar’s interpretation b) is along the same lines, eventhough SrI BhaTTar links the guNa to His nara-nArAyaNa incarnation specifically. e) For the current instance, SrI Sa’nkara uses the pATham a-nivRttAtmA, andthen gives the interpretation that because He is present everywhere, there is noturning away from anything for Him, and so He is a-nivRttAtmA. f) nivRttAAtmAno yena pralaya iti – He is nivRttAtmA because He withdrawsthe AtmA-s (jIva-s) into Him during pralaya. g) ni – nitarAm – wholly, completely; vRttah – sakala vishayeshupravRttah – exists in everything; One Who exists in everything, On Who haspermeated everything completely. h) ayogya-kRta ya~jnAdibhyo nivRtto vA AtmA mano yasya sa nivRttAtmA – HeWhose mind turns away from the sacrifices that are made by those who are notauthorized or not qualified to perform these sacrifices. pralayakAle vA sRshTer nivartata iti nivRttAtmA vishNurukto bhavati. j) SrI rAmAnujan also gives his anubhavam of bhagavAn's detachment from anyfeeling of self-glory over His greatness. Here He is, creating this great wonderwith all its innumerable creatures and all the planets and the different worlds.He is the svAmi of all these worlds - vIRRirundu Ezhulagum tanik kOl Sella;varambilAda mAyai mAya!. varambilAda kIrtiyAi! (tiruccanda viruttam 96). Withall this greatness, one would expect that He should have some attachment ofownership to His wonderful creation, and pride of this great creation of His.Yet, He does not have any of this sense of pride, and is only interested in ourwelfare instead, in whatever He does. Such is His greatness. In this sense also,bhagavAn is nivRttAtmA. SrI cinmayAnanda observes that the significance of the nAma lies inindicating to us that we have to detach our mind from sense indulgences in orderto realize Him. SrI rAdhAkRshNa SAstri notes that bhagavAn is the only one whocan retrieve those who are attached to all kinds of material and sense objects,because He is the only one who is not attached to anything. Only the one who isnot stuck in the mud can retrieve one who is stuck in it. The writer in dharma cakram points out that the significance of this nAma isto realize that we should live a life with detachment from material objects inorder to realize the Truth, and meditating on this nAma of mahA vishNu will helpus live that kind of life. Meditating on the Lord who has no attachments willlead us to live a life without attachment. He gives the life of Lord Rama as anexample of the life of nivRttAtmA. 1. It may be a result of the specificanubhavam that these great devotees of nArAyaNa have, and the way they feel theenjoyment of the nAma. 2. In addition to the above, the specific pATham may givea beneficial edge in providing an interpretation that supports the specificphilosophy that the particular vyAkhyAna kartA propounds or follows. 3. Adoptingdifferent pAThams may be a way of avoiding the issue of punar-ukti (repetitionor redundancy). SrI Sa’nkara’s interpretations for the above nAma-s in Sloka-s25, 48, 63 and 83 respectively, do not seem to suggest that he has adopted thepATham that he has chosen, for illustration of any specific advaita philosophyrelated issues. So it can be assumed that his choice is more a reflection of 1and/or 3 above. a) He Who is a naturally free Soul, since He is never born, not touches byeffects of karma, etc. b) He Who liberates the souls or jIva-s.
SrI Sa’nkara’s alternate pATham in Sloka-s 48 is vimuktAtmA. We did notcover this as part of Slokam 48, and so we will cover this here. The rootinvolved is muc – mokshaNe – to set free, to leave, to abandon. Vi is anuapasarga. a) The interpretation given by SrI Sa’nkara is: svabhAvena vimuktaAtmA yasya iti vimuktAtmA – One Who is naturally free. SrI rAdhAkRshNa SAstrigives the interpretation that the nAma stands for One Who has attained “viSeshamukti”, or liberation in a unique or special way. BhagavAn is naturally freein a unique way since He does not have birth and its associated avidyA, desire,etc., like every one else does. He is not affected by karma, the three guNa-s,etc. SrI cinmayAnanda translates the nAma as “The ever-liberated Self”. SrI Sa’nkara’s interpretation for this version is that bhagavAn is a-nivRttAtmA,One Who never turns away from anything, because He is in everything andeverywhere – sarvatra vartamAnatvAt s-nivRttah kuto’pi a-nivRttAtmA. Not toomany other interpreters have used this version. a) He Who cannot be under control except by devotion. b) He Who is Invincible. c) He Who makes it possible for us to conquer duhkham. d) He Who can be won over by difficult practices such as samAdhi etc. dus is an upasarga. ji – jaye – to conquer, is the root involved. a) SrI BhaTTar’s vyAkhyAnam is that it is impossible to bring Him undercontrol by the ordinary power of human or divine beings. The only thing by whichHe can be conquered is through total surrender (SaraNAgati) or through totaldevotion (bhakti), of which SaraNAgati is an a’nga. SrI satyadevo vAsishTha observes that anyone who follows the SAstric rules,and who performs actions consistent with His dictates, will always besuccessful. This is because bhagavAn resides in these people in His form as dur-jayah. This nAma is essentially same as the nAma a-parAjitah (nAma 721, Slokam 76,and nAma 866 in Slokam 92), and ajitah (nAma 553 in Slokam 59). In SrI BhaTTar’sscheme of organization of the nAma-s into groups, nAma 553 is interpreted in thegroup of names that describe Him as Suddha-sattva-svarUpI, nAma 721 is part ofthe same group that the current nAma belongs to, in that they both are part ofthe description in terms of the kRshNa incarnation. nAma 866 is part of nAma-sthat stress His guNa as a dushTa-nigrahan – One Who punishes the dushTa-s. Soit is interesting to see how SrI BhaTTar achieves differentiation in theinterpretation of these three similar nAma-s in their four instances. For nAma 553, where SrI BhaTTar’s interpretation is in terms of bhagavAnbeing of Suddha-sattva svarUpam, his anubhavam is that bhagavAn has this nAmabecause He is the Owner of parama padam, whose other names are ajitA, aparAjitA,ayodhyA, etc. Everything here is composed of Suddha-sattva material, and birthand death are unknown because nothing is composed of perishable material. SeeSlokam 59 for details on this nAma. For nAma 721, SrI BhaTTar gives the interpretation in terms of Lord kRshNa’srole in the mahAbhAratra war (see the detailed write-up for nAma 721 in Slokam76). Thus, all four interpretations describe His invincibility, but in eachinstance a different aspect of His invincibility is stressed. - For nAma ajitah in Slokam 59, “He Who has never been conquered in any ofHis Incarnations” – kenApyavatAreshu na jitah iti ajitah. - for aparajitahin Slokam 76, “He Who has conquered desires and the rest internally, and thedemons and others externally”. - For dur-jayah in the current Slokam, “HeWho is Invincible” – jetum na Sakyata iti dur-jayah. - For the instanceaparAjitah in Slokam 92, “Unconquered by gods and men” – Satrubhih naparAjita iti aparAjitah. c) Coming back to the interpretations for the specific nAma dur-jayah, inaddition to the interpretation ‘jetum na Sakyah dur-jayah’, SrI satya sandhayatirAja gives an alternate interpretation that He has the nAma dur-jayahbecause He makes it possible for us to conquer duhkha – duhkhasya jayo yasmAtiti dur-jayah. d) SrI baladeva vidyAbhUshaN gives yet another diversity to the anubhavam: duh-sAdhena samAdhinA jIyate hRdi vaSIkriyate iti dur-jayah – He Who is wonover by the difficult practices such as samAdhi etc. a) He Who cannot be bypassed by those who seek relief from samsAra. b) He Who cannot be transgressed because of fear of the consequences ofdisobeying Him. c) He for whom all sorrow is bypassed. d) He by transgressing whose orders, sorrow is the result. The root involved in the nAma is kramu – pAda vikshepe - to walk, to step.atikrama means overstepping, going beyond, breaching. except the worship of vishNu. There is no doubt about this”. through fear of Him functions indra, the wind, and Death as the fifth”. Out of His fear runs Fire, as also Indra and Death, the fifth”. duhkhasya atikramo yasya sa dur-atikramah – He for whom all sorrow isbypassed. d) SrI satyadevo vAsishTha explains the nAma as meaning that He bytransgressing whose order, sorrow is the result – yo bhAgavatam niyamam ulla’ngatesa SaSavat dukkhameva Apnoti iti dur-atikramah. SrI baladeva vidyA bhUshaN givesa similar interpretation – duhkhadah atikramah Sasana ulla’nghanam asya itidur-atikramh – Bypassing His order will lead to sorrow. dur-AvAsah – He Whose place of residence is not easy to attain. At first look, the above meanings seem very similar. So here we have anotheropportunity to enjoy how SrI BhaTTar and SrI Sa’nkara deal with theinterpretation of the nAma-s such that there is no redundancy. First, let us look at SrI BhaTTar’s vyAkhyAnam. d) The limitations imposed by the place where the person that issought is located. These are precisely the four aspects that SrI BhaTTar addresses, and assignsone of these for each nAma, each of which contributes to the difficulty in Hisunattainability. Thus once again he has nicely handled the issue of avoiding punar-ukti in the interpretation. 783a. dur-labhah - He Who is difficult to attain for those who are notsingle-minded in their devotion to Him. –janArdana is not within easy reach of those who have their minds after thingsother than Him. – O King! KeSava cannot be attained by men if their senses arenot conquered by them. “He is easy toaccess to the devotees who worship Him as their Lord, but for others, He is noteasily accessible”. It takes countless births of austerities and other good deeds before a humanbeing is rid of sins and develops devotion to kRshNa. 784a. dur-gamah – He Who is difficult to attain because of His Effulgence. Just as the mid-day sun cannot beseen by men with weak eyes, so also bhagavAn who is endowed with the brillianceand splendor of a thousand suns, cannot be accessed by weak-minded people. (SrIBhaTTar invokes the “daNDa pUpikA” nyAayam here, to reinforce his point: Ifa cake with some sticks embedded in the cake is left in a room, and if someonedeclares that sticks have been eaten away by rats, then it goes without sayingthat the cake has been eaten by the rats too. So also, if a trivial sun cannotbe seen by our eyes, need we say anything about our seeing bhagavAn with theradiance of a thousand such suns)? 785a. dur-gah – He Who is separated from us by our avidyA which acts like afortress between Him and us. The root is the same as for the above nAma: gam – gatau – to go. Here SrIBhaTTar ascribes His inaccessibility because of curtains or protections that aretoo difficult for us to go through, in the form of our a-vidyA or Nescience: avidyA AvaraNaih dush-praveSaSca dur-gah. The term dur-gah usually refers to afortification for a fortress, such as a moat. SrI v.v. rAmAnujan gives thederivation – duhkenApi gantum aSakyah – One Who cannot be reached even withdifficulty. but those who take refuge in Me alone shall pass beyond this mAyA”. The upanishads say that the Truth cannot be perceived by the senses, imaginedby the mind, or thought of by the intellect. These being the only source of ourknowing, it seems almost impossible to realize the Truth – yato vAconivartante… (tait. upa. 2.9.1). SrI cinmayAnanda reminds us that “He is inour heart, but even then He is not easily realized”. 786a. dur-AvAsah – He Whose place of residence is not easy to attain. evam ca dUre dushkarah tat-pada AvAsa iti dur-AvAsah. “One Who is far, far, away, and thus is noteasily accessible”. Now let us see how SrI Sa’nkara distinguishes between the four nAma-s sothat there is no redundancy in interpretation. dur-gah – antarAyapratihataih duhkhAt avApayata iti dur-gah. dur-AvAsah – duhkhena avAsyate cite yogibhih samAdhAviti dur-AvAsah. The distinction made in the first two nAma-s is “labhayata” vs. “j~nAyata”.Literally, the first refers to “getting Him”, and the second refers to “knowingHim”. The first can refer to those who can attain Him through pure devotion,without necessarily having the deep detailed knowledge of SAstra-s etc., and thesecond can refer to the mastery over the actual SAstric knowledge. The path ofbhakti is tedious, and so is the acquisition of knowledge about Him. In SrI Sa’nakara’s interpreatation, dur-gah refers to the multitude ofunanticipated obstacles in attaining Him, in addition to the known and inherentobstacles involved in the path of bhakti; and dur-AVAsah refers to thedifficulty in meditating on Him for prolonged period of time, even for the bestof yogin-s.
dur-labhah - He Who can be attained only through extreme devotion. byausterities, wisdom and meditation, practiced in thousands of lives”. The Supreme Person can be attained only by undivideddevotion, and by no other means. many, even having heard ofIt, cannot comprehend. and equallyrare to find a good student. 784b. dur-gamah – He Who is known only with difficulty. duhkhenagamyate = j~nAyate, j~nApyate vA dur-gamah. nAyamAtmA pravacanena lbhyo na medhayA nabahudhnA Srutena. durgam pathas-tat kavayo vadanti – kaTho. 1.3.14.
dur-gah – Not easily realized due to obstacles and difficulties. Even for those who attempt the difficult means towards bhaktiyoga, there will be many unexpected obstacles that will keep cropping up. It isprobably these difficulties that are being referred to here. 786b. dur-AvAsah – Not easily retained in their mind by even yogin-s duringdeep meditation. SrI Sa’nkara’s words are: duhkhena AvAsyate citte yogibhih samAdahu itidur-AvAsah. I do notsee that it can be steady because of the fickleness of the mind”. SrI baladeva vidyA bhUshaN intereprets the nAma as referring to thedifficulty of retaining Him in our hearts – duh-sAdhayA prapattyA vAsyate hRdiiti dur-AvAsah – He Who will be retained in our hearts constantly only throughthe difficult path of prapatti. (According to the rAmAnuja sampradAyam, prapattiis the easiest way to attain Him, as long as one can qualify with the five a’nga-sof prapatti. One of these is mahA viSvAsam, or the unshakable faith that He willdefinitely protect us once we surrender to Him. Perhaps, this is one of the mostdifficult mental states to acquire, and so one can consider that prapatti isdifficult in this sense. Thus, SrI kRshNa datta bhAradvAj’s interpretation is that He is a sulabhan,or easy of access, for a true devotee. He is easy to attain, easy to retain,easy to access, etc., as far as a sincere devotee is concerned. SrI satyadevo vAsishTha gives the anubhavam that even though bhagavAn ispresent in everything and everywhere, and in all of us, and is the force behindour every action, still it is so difficult for us to appreciate this and evenaccept this. Given this state of affairs, to know His svarUpam is next toimpossible for most of us. Hence He is called dur-labhah. SrI vAsishTha pointsout that this jIva does not have the ability to know when life will leave thisbody, and when the jIva will take the next SarIra, or anything else. Herhetorically asks the question of how much more difficult it will be to know Histrue nature in full, and to attain Him. He observes that even the likes of sageMarkaNDeya with his long life did not succeed in understanding Him fully. So SrIvAsishTha’s interpretation is that bhagavAn is called dur-labhah because He isdifficult to attain even for the best of the sages. For the nAma dur-gamah, SrI vAsishTha gives the anubhavam that the nAmarefers to bhagavAn’s Eternal Principle that He reflects everywhere in Hiscreation – namely, that even though He is inside all of us and thus very nearto us, still He is very far for most of us, and so inaccessible. It is thereflection of this Eternal Principle of dur-gamatvam that we cannot accompanythe jIva with our body when it departs the body after our death, no one knowsexactly what another person’s thoughts are, etc. He Who isknown through the tedious and difficult process of inquiring into the upanishads. 785c. SrI vAsishTha points out that bhagavAn is ananta or Infinite, and thesuccess in realizing Him is related to the effort that is put in, but is nevercomplete. This is the sense of the nAma dur-gah - He Who is difficult to beaccessed in His totality. For humans who are constrained by the limitations oftheir antah-karaNa-s (the seat of thought and feeling, the mind, the thinkingfaculty, the heart, the conscience, the soul), He is dur-gah. He Who causes pain and suffering to theevil-minded rAkshasa-s. The root used here is gam – gatau – to go. 785e. SrI baladeva vidyA bhUshaN interpets the nAma dur-gah using the root gai – Sabde – to sing, and gives the interpretation that the nAma refers toHis being sung through sAma gAnam which is difficult to learn, practice andmaster. “Reverence to the Supreme Brahman, whose base is earth, whose stomach isair, and whose head is the sky”. durgatamapi prANivargam yathAvyavastham duhkham anubhavantam AvAsyati itdur-AvAsah. a) He Who is unapproachable in the context of His Effulgence. c) He Who can be known only by thedifficult process of enquiry into the upanishads etc. c) He Whose realization is constrained by our own limitations. d) He Whocauses pain and suffering to the evil-minded rAkshasa-s.
e) He Who is praised bythe sAma gAnam which is difficult to master. a) He Whose place (SrI vaikunTham) is inaccessible to us. c) He Whose precise location can never be specified because Heis everywhere and in everything. d) He Who supports the lives of even thosecreatures which do not have access to the essentials of life as we know them. It is important to keep in mind the point brought out by SrI kRshNa dattabhAradvaj in the context of these four nAma-s, namely, that in the case of thosewho long for Him, He removes the obstacles, and makes sure that He is easilyaccessible. He uses diverse means to get rid of the enemies or mislead them etc.We will see this aspect in the next series of nAma-s, 787 to 810 in SrI BhaTTar’sscheme of interpretation. a) The Dispeller of the evil-minded enemies. b) TheDispeller of evil thoughts from the minds of the devotees. This is the first of the series of nAma-s that are interpreted by SrI BhaTTarin the context of bhagavAn’s Buddha incarnation. The word is made up of dur + A + ari + hA. dur and A are upasarga-s. dur heremeans bad. A stands for samanta – complete, entire ( A samantAt – SrIvAsishTha); ari refers to foe, and hA stands for destroying or killing, derivedfrom the root han – to kill, to destroy. SrI vAsishTha explains the termdurArih as meaning “one who causes pain and misery from all sides” – duhkham samantAt arpayati prApayati iti durArih. The nAma durAri-hAstands for“He Who destroys the durAri-s” – durArih tAn hanti iti durAri-hA. “By His powerful skill, He confounded in several ways their minds, and ledthem astray, as a result of which there was no one amongst them who had a likingfor the veda-s. They became averse to going in the right path, and they wereeasily disposed of by the gods”. idam daurlathyam aprapipsupApavishaye prayacchan budddhAvatAram niyacchati – durAri-hA. SrI v.v. rAmAnujan refers us to tiruvAimozhi 5.10.4: . kalandu aSurarai uLLam pEdam SeidiTTi uyir uNDa uPAya’ngaLum…. “Your spreading anti-vedic religions, say, as Buddha, your contriving toseduce asura-s at the time of distribution of nectar as Mohini, …These melt myheart. Why do you do all this, My Lord?”. “mAyASastrANyapi damayitum tvat-prapanna-pratIpAn” – to control the enemies ofYour devotees, You create the mAyA SAstra-s also. SrI rAdhAkRshNa SAstri givesreference to the kaushItakI upanishad, which also reveals this same truth: “eshau evainam asAdhu karma kArayati tam yamadho ninIshate” (3.9) - He makes themdeviate from the good and proper karma-s, and makes them perish in the process. b) SrI satyadevo vAsishTha gives a different anubhavam. He takes the termdurAri to refer to the bad aspects of our intellect, and gives theinterpretation that the nAma means “One Who destroys the negative aspects inour mind when we resort to Him” – dur-matih tAm hanit iti durAri-hA. Heindicates that this is the worship we do through the mantra “tat saviturvareNyam bhargo devasya dhImahi dhiyo yo nah pracodayAt”. SrI cinmayAnandagives a similar explanation – bhagavAn is called durAri-hA because, out of Hiscompassion, He destroys the Asuric tendencies in us and redeems us from its sadconsequences, when we invoke Him. He destroys those who flout the dharma mArga and who are His enemies. With His help,it is not at all difficult to overcome the enemies such as kAma, in our path toHim.